Susan’s work required her to be Asia, so we decided to combine her trip with a multi-country 3 week vacation, including Java and Bali (Indonesia), Sri Lanka, and Mumbai, India. Susan was originally planning to leave on a Thursday. With a major snowstorm about to hit the Wednesday before, she decided – at the last minute – to leave two days early and spend the extra time in London. (Ahh… the joys of living in New England.) Susan then spent a day in Mumbai on her way to a conference in Kuala Lampur. We met up in Yogyakarta, Indonesia, at the end of a 4-day training that Susan was involved in there. Phil was on a frequent flyer ticket, and had to travel on 5 flights over 38 hours to get to our meeting place. Other than the initial scurrying to beat the blizzard, and mind-numbing jet lag, everything went remarkably smoothly. Susan had no idea what to expect in Kuala Lumpur, but this city looks like an American city, except that there’s lots of tropical greenery everywhere – median strips, pocket parks, tree lined streets. Very modern, but not futuristic like Beijing – it could easily be Seattle, complete with KFCs and McDonalds. While some women are wearing hijabs, others are wearing miniskirts and shorts. While Malaysia is certainly more conservative in the rural areas, Kuala Lumpur is multi-ethnic, very cosmopolitan, and felt quite safe. Although Air Asia is amazingly cheap, some of their flights are at ridiculous times. Susan had to get up at 3:15am to catch her flight to Yogyakarta. Although Indonesia is east of Malaysia, it is one hour behind, her day was even longer than any day would be that starts so early in the morning. We met up in Yogyakarta – Phil recuperated while Susan completed the work she was doing, and we then had 4 days in Jogya (as everyone calls it) Although Jogya has over 3 million people, it has no tall buildings and lots of beautiful gardens, so feels like a very appealing and attractive city. The city is full of becaws (pedicabs with the driver in back) constantly offering rides, and small shops with wonderful textiles. Most of the buildings are one-two storeys, so in spite of its size the city feels very manageable/human scale. It is the arts center of Java, and also has many students, so evidence of the arts is everywhere. There was even gamelan music at breakfast some days – a bit of a mixed blessing, but a nice touch reminding us where we are. It was wonderful to explore Yogyakarta. We wandered around poking in batik shops, going to the Kraton (the Sultan’s palace and environs) and learned to squeeze into the becaws. We walked up and down Marlioboro Street, the main drag which is lined with vendors of soft goods – lovely things, and the bargaining is gentle and good humored. We found the Indonesian people to be very warm and friendly. Yogya felt incredibly safe, a far cry from the western images of Indonesia. Near Jogya is the Buddhist temple of Borobudur, considered to be one of the treasures of the world, and it is truly impressive. It was bombed by terrorists 10 years ago but has been carefully repaired. One enters and circles around the levels, ascending as if to heaven, looking at all the incredible carvings along the way. At the top are massive domes, each with a Buddha inside. Because it is the rainy season, there are relatively few tourists, so it was great to have the place more or less to our selves. (and we had a dry day). While we were touring the temple, workers were scrubbing off the volcanic ash. Ah, the rainy season…each afternoon it rained for between 30 minutes and 2 hrs. At the end of our day in Borobudur, the rains started when we were just outside of Jogya, and it actually felt like a hurricane – sudden stiff gusts of wind blew ceramic tiles off of the roofs, and the streets flooded. From the travel agency where we needed to settle our bill, it was about 2 blocks to our hotel. We ended up taking off our shoes and socks to walk (or rather wade) back; fortunately we had our umbrellas. It was quite an adventure. To recover, Susan had a facial around the corner from our hotel – it was GREAT, and $3 (plus tip!). In the evening, we went to a performance of the traditional Ramayana dance performance, complete with gamelan music. On another day we visited the Hindu temples of Pramabahan – an amazing complex of towers visible from miles away. Again, the carvings just blew us away, and the lush tropical surroundings could only be southeast Asia. We also stopped at a few smaller temples as part of the tour – so much to see in this part of Java. We left Jogya and arrived in Bali around 10am (finally – a flight at a civilized time! ), and it was about an hour to get up to Ubud. We were delighted to find that our hotel far surpassed our expectations – a lovely canopy bed with the towels folded into lotus blossoms, a balcony that overlooked rice paddies and a huge bathtub with views out over the landscape. On our first day, we explored Ubud a bit, and were taken a bit aback at the endless chi-chi shops and traffic. On the second day, we hired a cab to take us to several beautiful temples outside of Ubud. This was a highlight, as the scenery in Bali is gorgeous. The next day decided to do some exploring on our own. We rented a motorbike (one; Phil drove, while Susan hung on). We had some initial fears, as there is a lot of traffic in the city. However, once we got out of the city it was wonderful – lush rice paddies, beautiful blossoming trees, and an infinite number of temples. Every neighborhood has three temples – for Vishnu, Shiva, and Brahma, and each family also has a private temple; size of course being a sign of status and wealth, so that some very humble homes have quite elaborate temples. In the evenings, we went out to see dance – the first was Kecak, with 40 men doing an acapella version of gamelan and dancers enacting a story from the Ramayana. The next nite we saw a Legong performance in the former royal palace. Legong dancers are able to bend their fingers backwards, and train from childhood in this art form, which includes exaggerated eye movements, similar to Indian kathak dance. Unfortunately, Ubud is not an attractive town. There are lots of tourists and shops, Starbucks clones, pizza joints, western-style bars, and shops selling plastic trinkets. However each night there are multiple music, puppet and dance performances. We saw one performance every night we were there. The people in Ubud look very different than in Java. The Hinduism here is quite different than India – infused with the beliefs that existed before Hinduism – and the temples are riotous edifices of sculpture, guardian gods, and flower offerings. Brahma is actively worshipped here, and temples to him are ubiquitous (In India, Brahma temples are very rare). We also saw Durga (instead of Pavarti) and Surya (an aspect of Shiva) frequently being worshipped. Of course, in India, there are regional differences as well. Colombo, the capital, is a rambling huge city, full of traffic with no well-defined center. While few people regard Colombo as a destination, we enjoyed our time there. We visited the museums, perused the shops, and visited Buddhist temples. At sunset, we enjoyed drinks on the deck of the old Galle Face Hotel – a charming vestige of the British colonial period – while overlooking the Indian Ocean. Sri Lanka is well-known for crowded rough roads and kamikaze drivers. Before we left home, we arranged a car and driver. One could do this on arrival, but this gave us a chance to make sure that the company was reliable. We couldn’t have made a better choice. So the next morning, we were met by our driver and began our exploration of the “Cultural Triangle” – the ruins of the ancient Buddhist dynasties of Sri Lanka. The history here of the various invaders from India and the blending/conflict of Hinduism and Buddhism create unique temples and culture, yet we feel that our experience with India is helping familiarize us with our surroundings. Our first destination was Anuradhapura. We knew that record breaking rains had caused severe flooding in the eastern half of the island earlier in January. These came at the end of their monsoon season, and we had read that things were returning to normal. Unfortunately, global climate change had caused the region continual flooding. It started raining as we left Colombo, but despite washed- out roads and overflowing rivers, we were able to make it to Anuradhapura. We were able to get to one of the ancient Buddhist temples, founded in 300 BC, full of beautiful carvings, before battling the flooded roads to get out of the town. Due to the heavy rains (very unusual for this season) we rearranged our itinerary, needing to cancel our trip to Polonaruwa and other parts of the “cultural triangle.” Kandy is the second largest city in Sri Lanka. Our hotel overlooked a beautiful lake. Once we got to Kandy, we actually had 2 days of no rain, which gave us a chance to visit the Botanical Garden and also go to the wonderful caves at Dumballa, which was a treat. These caves, over 1500 years old, have multiple images of Buddha and amazing wall paintings. We also visited spice gardens and a tea plantation. Kandy is the second largest city in Sri Lanka, up in the hill country, surrounded by plantations growing tea and spices. Kandy prides itself on preserving Sinhalese culture through the occupations of the Portuguese, Dutch and British. In the 18th century, the king of Kandy converted the rice paddy fields in the middle of the town into a huge lake. Many decried his waste at the time, but it is now a beautiful centerpiece to the town. Colonial buildings on one side, lovely views of the mountains, one crowned by a giant white Buddha, on the other. 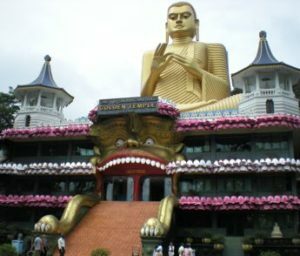 We have used Kandy as a base to explore – went up to Dambulla on Saturday – a series of cave temples with incredible paintings, stopping at several other temples along the way. Hinduism and Buddhism have blended here – many Buddha temples have a Buddha statue in the middle and a side sanctuary honoring Vishnu. Only one had a temple elephant so far, however. The town itself is pleasant and has lots of great sites – including the Temple of the Tooth, which proudly exhibits a tooth of the Buddha. This relic is worshipped with great fanfare: processions, drumming, and the presence of many devotees. The city also boasts a museum, but it was mysteriously closed during our visit. This was our third trip to Mumbai, and as before, we enjoyed every minute. There are many changes since we were last here due to the terrorist attacks. There is now security to get into the Taj Hotel and many of the nearby shops (closing the door after the horse has escaped). There are more shops aimed at the middle class – evidence of India’s booming economy is everywhere. Our favorite restaurant was still there, and we ate most of our meals there – to the amusement and obvious pride of the staff. There was an arts festival while we were there, and we were able to see great dance performances, both classical Indian and an amazing modern group called “Salsa India”. By some amazing coincidence, we ran into one of Susan’s friends who had worked with her in Indonesia a few weeks earlier – what are the chances of that in one of the largest cities in the world? One evening we met some other friends of Susan’s for dinner in a northern part of Mumbai. We took the Mumbai commuter rail out of Victoria Terminus (VT), an experience unto itself. Being slightly wimpy, we bought first class tickets. But the scene (stampede) was unforgettable. We visited the Mumbai synagogue on Saturday morning. We learned that the chazzan, Benjamin Simon Dandekar, who had been so warm and welcoming when we visited before, had since passed away. We also learned that, following the terrorist attacks on Mumbai in November 2008, the three Mumbai Jewish congregations had unified and now held joint Shabbat services. The Jews of Mumbai hadn’t previously, in their 2000 year history in India, experienced anti-Semitic attacks. Hotel 1001 Malam: A small hotel with 16 rooms in a great location, near restaurants, shopping, tour/transportation companies. Located in a quiet alley, this lovely hotel had a hand-carved teak façade and hand-painted murals in each room. The interior garden was an oasis of tropical greenery. The staff was wonderful, the breakfasts (banana or pineapple crepes) were delicious, and the round-the-clock availability of coffee and tea was a nice touch. Free wifi and great prices. We could easily imagine spending more time here – if only it weren’t a zillion hours away. Saren Indah – We somehow found the perfect place to stay – at the edge of town away from traffic, a lovely room with views of the rice paddies and birds, and towels folded in amazing shapes on the bed – lotus flowers, swans, even hearts! This was an amazing hotel, about a 10 minute walk from the town, but through the monkey forest! It’s like a high end resort: a canopied bed, a deck with views over the rice fields, and really nice staff. A full breakfast is included as is tea with wonderful Indonesian pastries each afternoon. There is even free wifi! The swimming pool was crystal clear, and the grounds are meticulously maintained and decorated with lotus and jasmine flowers. The staff could not have been nicer, and the monkeys who occasionally visited were well-behaved. Shalini Hotel: Not all our hotel choices were good. The Shalini Hotel was marginal, with overpriced coffee and breakfast, rooms with mildew and mold, and pricey internet. The place was run down and not very clean. The rice and curry dinner was very good, which is good, because there is nowhere nearby to eat. Fortunately we were only there for one night; we survived. Sharon Inn: The Sharon Inn was highly recommended in guidebooks and Trip Advisor, and it was clean. However the owners are brusque to the point of rudeness and very unwelcoming. When we had trouble using the wifi, the owner became hostile and rude, even vaguely anti-American (she’s European). This, combined with an odd list of rules posted on the door, made us feel unwelcome. The Sharon Inn is also a bit out of town. When we told the owner that we were leaving after two nights, his answer was a curt “Good. We need the room.” And, unlike all the other hotels we’ve stayed at, there were no driver’s rooms. The Sharon Inn did serve the best meal we had in Sri Lanka – rice with curry, at least 15 different very well-prepared dishes. The Queens Hotel: Clearly a leftover from the British colonial period, this elegant hotel was lovely and charming. Located in the heart of the town, just a five minute walk from the temple of the tooth, this hotel was the polar opposite of the Sharon Inn. The wifi was free, fast, (although only in the lobby), the breakfast was a huge buffet, and the large room had high ceilings and was nicely furnished. The staff were, without exception, the friendliest and sweetest we’ve encountered. Our driver also loved this hotel, as the drivers’ rooms are also very nice – and many of his friends stay there. It was almost double the price of the Sharon Inn, and worth every penny. Hotel Diplomat: We usually stay at the Suba Palace (see below). Since we changed our itinerary and the Suba Palace had no vacancy for the first two nites, we chose the nearby Hotel Diplomat. This place is a bit run down, but clean, well-located – and not bad. The breakfast was fine, and the staff was helpful. Our only complaint was that the price was too high for what they were offering. The Diplomat is a 2-star hotel, but they charge NYC rates. Hotel Suba Palace: Although some books rate the Suba Palace as a 2-star hotel, it felt like 4-star luxury after the Diplomat. Everything about the Suba was perfect in every way, and the staff could not have been more welcoming. There are many travel shops that offer cars – this one was prompt, the driver was helpful, and their prices were very reasonable. The car was very comfy! We booked 2 different car/driver tours with them and recommend them highly. Everything about this company was perfect. The price quote was good, the manager was fast in responding to our emails, the car was comfortable, and our driver (Mr. Thilanka Thamel) was GREAT! His English was good, and his patience, skill, and warmth made our trip memorable. We had to make a number of changes to our itinerary due to flooding in the Anaradapura and Polonarruwa areas. From the first day, Thilanka put our safety first, but also did his best to get us where we had hoped to go. In Anaradapura, he found a guide who could identify which roads were still open, and we were able to visit part of the ruins. When leaving Anaradapura, many of the roads were impassable due to high waters; Thilanka calmly backtracked several times until he found a way to get us down to Kandy. He loaned us his cell phone and helped us to make changes to our hotel arrangements, and made suggestions for an alternative itinerary in the area around Kandy. Thilanka was knowledgeable about the area and a safe and careful driver. A bonus for us was his engaging and friendly personality.